2006. The year my life turned upside down. We were set to move into a rented apartment close to the complex where my family had bought a house, when my father passed away. Plans changed, and we decided not to move from where we were staying. Unfortunately, friends from France had already sent a parcel for me to the new address. Caught up in the aftermath of my father’s sudden demise, I didn’t think about it, till weeks later, but didn’t know what could be done about it. My friends and I assumed the parcel lost forever. 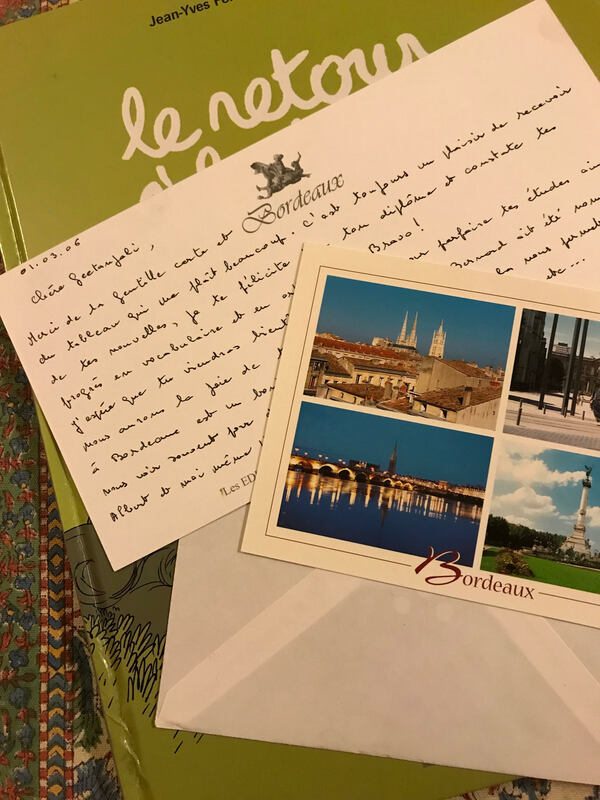 Last week, as I was returning home, I received a message from a student, asking if I knew Rose and Jacqueline from Bordeaux. Surprised and terribly curious, I wondered how she could possibly know my friend’s mother and mother-in-law. I asked her how she knew them, only to have her turn around and ask me if they had sent me a book and postcards. I can’t even begin to describe the sheer thrill of realising that the parcel sent to me in 2006, was finally going to reach me in 2018! The expression snail mail suddenly meant much more to me, than ever before, but more than that, was the concept of a miracle. My student, who was visiting Pune, had discovered the parcel in one of the cupboards at her parents’ home. Two years ago, the postman dumped the parcel on them, even though they told him it wasn’t for them. Not knowing what to do with it, they put it away and forgot about it…and that’s where it stayed till my student went to Pune last week, to help her them pack before they sold their house. She saw my name on the parcel, and immediately reached out. 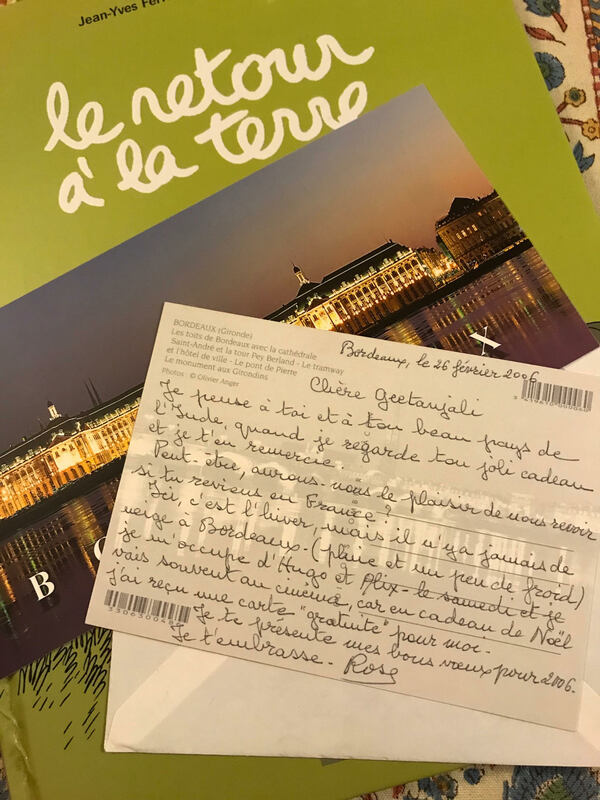 What’s amazing about this story is not just that the Indian Post decided to randomly deliver the parcel ten years after it was sent from France, but that it went to my student’s house! This is a student who was transferred to my class a month after the session started. Had she not been transferred, she would have never met me, nor made the connection between Geetanjali Shrivastava, one of the teachers at the Alliance Française de Bangalore, and the rightful recipient of the parcel lying at her parents’ home! If there was ever a moment in my life, where I could say that I believed in miracles, this was it. Thank you K, for this miraculous surprise! Wow, Geets, that’s seriously, literally, both incredible and awesome! I can just imagine the range of emotions you must have felt. Wonderful.